Saddlesworth Morrismen and their rushcart in 2005. "For hundreds of years rushes, hay or straw have been ceremonially strewn on the floors of churches (and houses) to make them warmer underfoot, to sweeten the air and to muffle the sound of heavy boots. Mixing the prosaic and the symbolic, rush-bearing ceremonies once took place all over the country, but maintained greater significance in the North West on the local saint's day or wakes week ... In the Pennine village of Saddleworth the rush cart may be pulled by up to one hundred morris men, with forty acting as brakes." 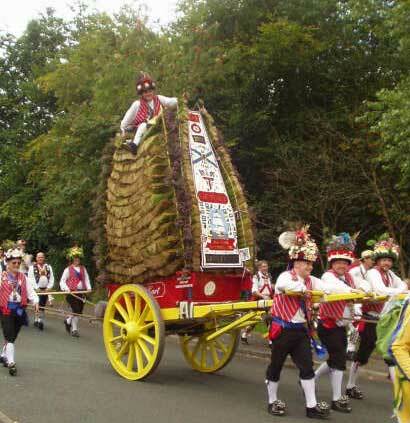 Rushbearing festivals are held July through September in northwest England in the towns of Ambleside, Brough, Grasmere, Marsden, Whitworth, Littleborough, Saddlesworth, and Sowerby Bridge. In each town the rush wagon is the highlight of the parade accompanied by Morris dancers, mummers, school children in festive dress, and marching bands. Up to 100 men pull the cart wearing colorful costumes and flowered hats that they have made for the occasion. Half as many men hold ropes attached to the back of the cart and act as brakes to keep the heavy cart from running away on downgrades. It is so popular that the waiting list to get on the rushcart team is long enough to field a second team. Each year a brave man or young lady, called "the maiden," is chosen to act as jockey and sit on top of the precarious load. The rush wagon is topped with a staff to push branches out of the way. The staff is sometimes decorated like a Chrismas tree and, in an 1865 account of a rushbearing in Sowerby Bridge, it was shapped like a beehive and covered with silver watches! The cart begins with a stop at a Catholic church (because the Protestants historically looked unfavorably on drinking) to receive the blessing of priest on the cart and to pray for good weather. Then the cart winds through the town stopping at other churches and, of course, pubs along the way. thatching. Photo by Richard Sunderland. Finally it lands in the town square where the locals hold Morris dance competitions and a charity/craftmarket. In Sowerby Bridge, parade walkers raise money for cancer research by getting sponsors who will pay based on the distance walked. There are foot races and games for the children and lots of great food booths for everyone. Rushbearing was first mentioned in law when King James I allowed rushbearing on Sundays in a bulletin published in 1618. At that time it was already an old tradition. Rushes, reedy plants that grow in marshes, were used in the stone-floored churches to provide a fragrant carpet. As they dried, the rushes absorbed the odors in the damp church and kept the floor from chilling the feet of the parishoners. They also helped the acoustics in the churches by muffling echos and the sounds of shuffling feet. Each summer the old rushes were swept out and new rushes brought in, providing an opportunity for a communal project and an excuse to celebrate. Rivalry between the builders and supporters of different carts was often intense and lead to brawls, no doubt brought on by the high consumption of alcohol that often accompanied these celebrations. For this reason the Protestant ministers in England would not allow the rushbearers into their churches. The tradition died out as newer churches were built with heating systems and wooden floors but a few towns kept holding festivals as a way to celebrate summer. However, by the middle of the 20th century, this once common tradition was all but a memory. In Saddleworth, the custom was revived in the mid-1970s, and continues to be held on the second weekend after the 12th of August, marking the weekend of the Saddleworth Wakes, when mills and factories historically shut down for a one-week holiday. 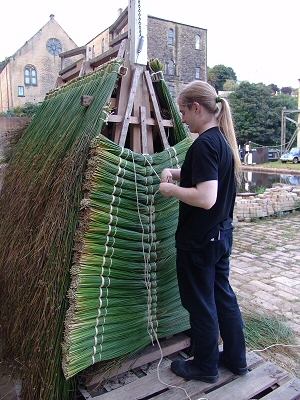 The reeds are collected from the moors three weeks before the event and built onto the cart in the week before. A jockey from the Saddleworth Morris Men rides the 15' high cart as it is pulled around the Saddleworth villages during Saturday by Morris and mumming groups from all over the area. There are performances of all styles of Morris dancing at each village, and then an evening of music back at Uppermill in the Church Inn and Cross Keys Inn. On Sunday morning the cart is pulled up the steep hill to the mother church for a service where the cart and Morris men are blessed. All the competing Morris groups perform outside the church in the natural arena, where 2000 to 3000 people have been known to attend, sitting on the banks. There are also competitions in wrestling, music, clog stepping and gurning. On Sunday night, everyone enjoys more music in the pubs again. College rush week has a lot in common with rushbearing in England with all the crazy antics, dancing, drinking, parades, and rivalries. The only difference is that rush carts have brakes. If you want to add this article to your list of favorites or email it to a friend, please use this permanent URL, https://stores.renstore.com/-strse-template/0809A/Page.bok. Permission is granted by the author to quote from this page or use it in handouts as long as you include a link back to Renstore.com.